Protect & manage the lifecycle of you most valuable, physical assets with Amex - asset management software. The backbone of many industries are the assets & equipment used to maintain their day-to-day operations. Asset management extends beyond basic equipment coverage-it refers to the whole spectrum of organizational assets. You can't afford ruin time, efforts & cost searching for assets or replacing lost assets. 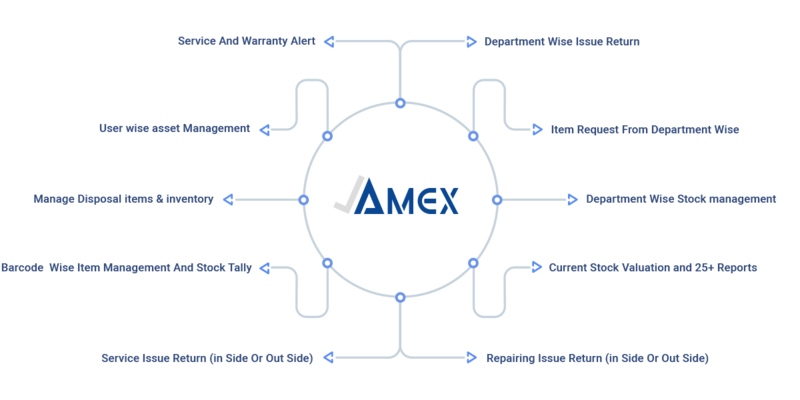 AMex asset management software tracks your assets, where they are, what the cost, who's the vendor, where can i find service center which assets are having lot of service issue and more. By using AMex you can set barcodes to all assets and manage warranty and services record. AMex Provides superior baseline for asset inventory & tagging services to organization across all industries. The Asset inventory data becomes the foundation for efforts to limit capital spending, mitigate maintenance, optimally utilize and repair expense, and control variety of other operational aspects of physical assets. AMex asset management software any business can analyze their assets, asset accounting, price prediction & product Life prediction.